A broad, informative, if not at times slightly whistle-stop review of the current state of astrobiology and planetary exploration. Coustenis and Encrenaz do a fantastic job of bringing the reader up to speed with the most recent astrobiological missions, as well as the resulting developments in our understanding of the history of and current environment on a wide range of worlds in our Solar System and beyond. At times however, the narrative does become lost amidst a sea of facts and figures and very rarely are the thoughts and opinions of the authors expressed, the exception to this being the interesting final chapter of the book which provides a look at the future survival of the human race. The book begins with a discussion of what life is and some of the thoughts on the origins of life of Earth. Terrestrial extremophilic life is examined as an analogue of the kind of life that might exist elsewhere in the solar system and there is even a brief section on truly alien life, such as non-carbon based life. The following two chapters discuss the various worlds of the inner and outer solar system in turn, giving details on exploratory missions and the wealth of information that we have gathered from them. Environments in which it is thought that life is most likely to exist and future missions to such places are highlighted. Another chapter is dedicated to the search for extrasolar planets and the leaps and bounds with which this field has come on in the last two decades. Particular emphasis is given to the remote characterisation of exoplanetary atmospheres, which is sure to become an extremely hot topic of research in the near future. The book concludes with a unique and fascinating glimpse into the future of the solar system and how humanity might begin to influence its worlds in order to ensure its continued survival. Coustenis and Encrenaz’s writing style makes for very easy reading, although as already mentioned the statistics and chemical formulae that litter a number of pages can occasionally make the prose a little jarring. The inclusion of boxes containing “more in-depth material” was a nice idea, however they don’t seem to work as well in a small prosaic book such as this as they might have done in a larger textbook. Their placement right in the middle of other sections of text is often an annoying distraction. Conversely, a particularly enjoyable feature of the book is the numerous interesting and well-produced images, diagrams and artists’ impressions. They do a wonderful job of illustrating points made in the text and are all reproduced in glorious colour in the centre of the book. 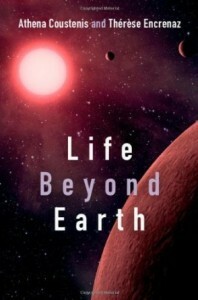 The level of assumed knowledge does exclude the majority of the “popular science” audience and a more technical reader would likely find nothing new here, however Life Beyond Earth is a perfect introductory text on astrobiology for anyone with at least A-level science training, or for others a great reference book. It’s an enjoyable, well-researched book that unfortunately doesn’t quite elevate itself above similar texts.